I wrote this story for Grist, where it first appeared on November 30, 2010. A day after Energy Secretary Steven Chu’s “Sputnik speech,” in which he warned that China was investing billions in renewable energy while American politicians bickered over small-potatoes stimulus spending on green technology, a report from Ernst & Young released Tuesday confirmed Asia’s ascendancy. “A new world is emerging in the clean energy sector with China now the clear leader in the global renewables market,” the report’s authors wrote. Ernst & Young publishes a quarterly “country attractiveness” index for investors that ranks nations’ renewable energy policies, renewable energy markets, and other factors. China took first place — again — ousting the U.S. from the spot it had occupied between 2006 and 2010. 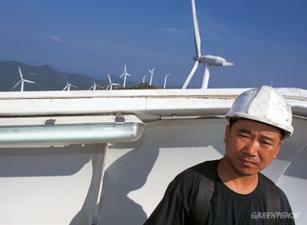 Half the wind turbines that will come online this year worldwide will have been made in China, according to the report. “Since reaching top spot in our index in September, China has opened up a healthy gap from other markets,” Ben Warren, an Ernst & Young executive, said in a statement. “Cleantech, including renewable energy, represents a significant part of the country’s future economic growth plans. And China clearly has its eye on the U.S. market. As I wrote last week, one of China’s largest solar companies has formed a joint venture with California startup SolarReserve to build photovoltaic power plants in the desert Southwest. And it’s not just China the U.S. has to worry about in the green energy race. According to Ernst & Young, South Korea, Romania, Egypt, and Mexico are rising fast as their governments devote more resources to renewable energy.